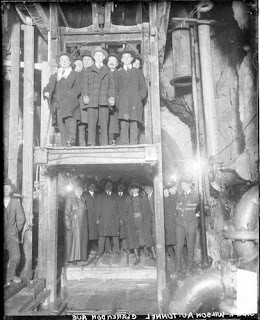 Image of a group of men standing on an elevated platform in a tunnel with several other men standing on the ground under and around the platform. They are at the West Wilson Avenue and North Clarendon Avenue tunnel opening in Chicago, Illinois. Several bright lights are shining in the background. DN-0069960, Chicago Daily News negatives collection.